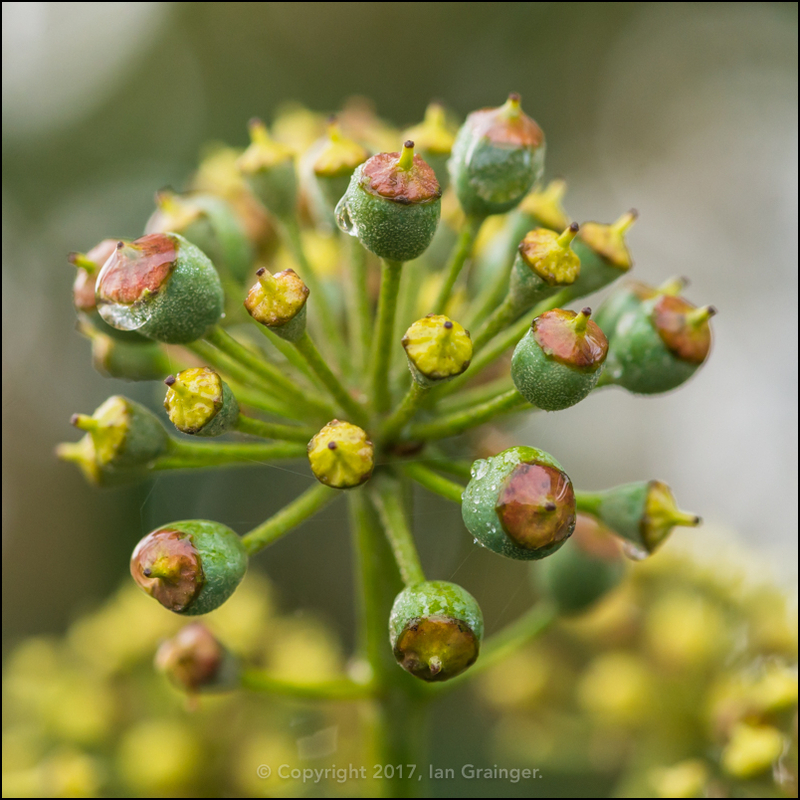 This week my Sunday morning photo shoot took place in warmer weather conditions than it had in recent weeks, although the bright blue skies had been replaced by dark grey ones. On the plus side, it wasn't raining, but it was still decidedly wet. 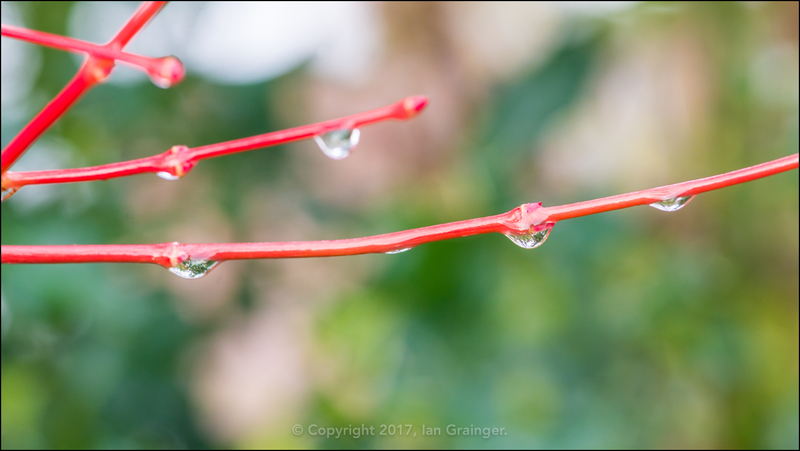 However, as you know, raindrops can make even the most uninspiring of subjects look interesting, so I went off in search of some damp subjects. 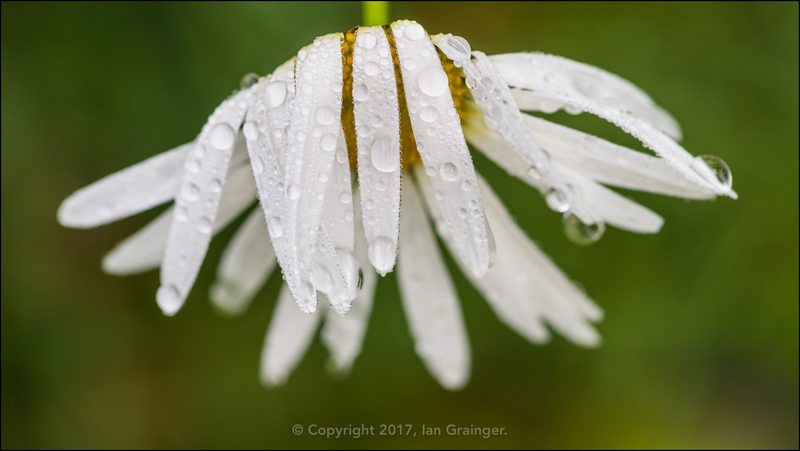 Imagine how pleased I was to find the very last Oxeye Daisy (Leucanthemum vulgare) in dad's garden, bowing down under the weight of a multitude of raindrops. 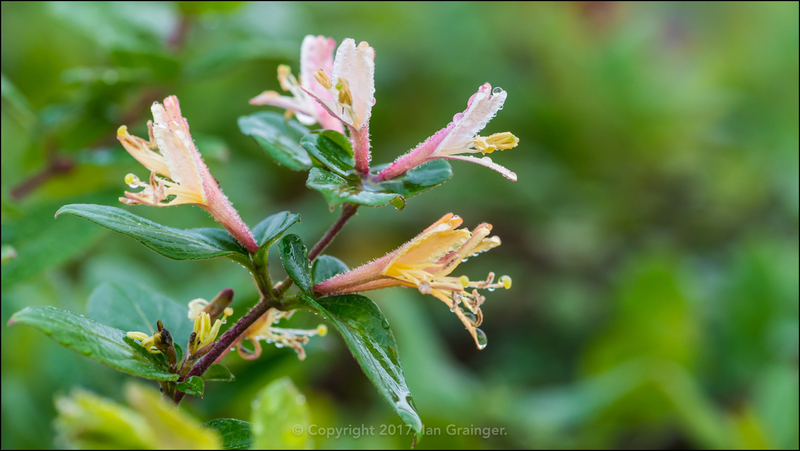 The Winter Honeysuckle (Lonicera fragrantissima) was beginning to look great, with white and yellow flowers both appearing on the same stem. 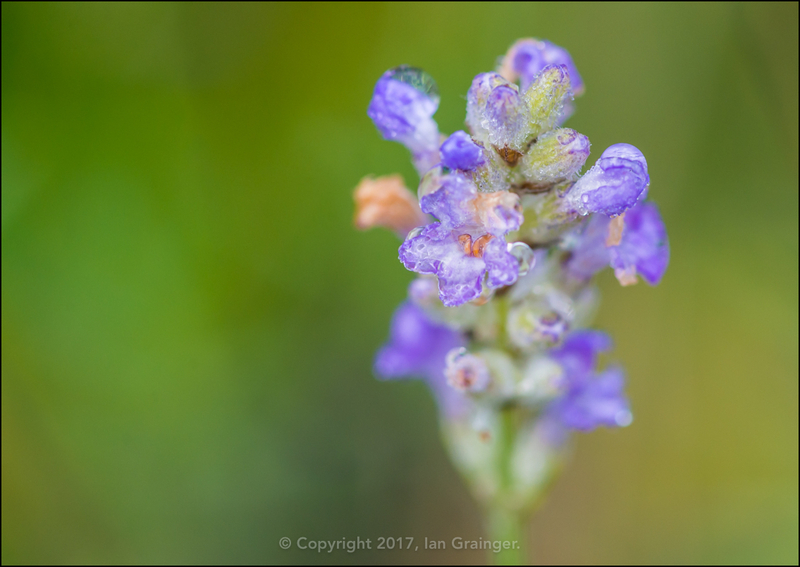 I thought that the Lavender (Lavandula) had finished for the year, but came across a few flowers still hanging on to life in a sheltered location beside a large flower pot. 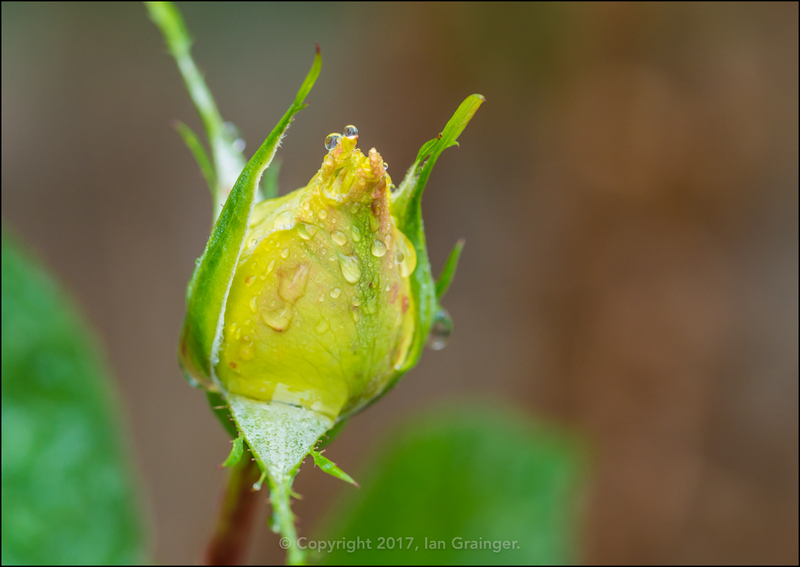 I was still hopeful that we'd be getting a few last Roses (Rosa) before the heavy frosts hit, and it looked like this rosebud was on the cusp of opening. Maybe next week? 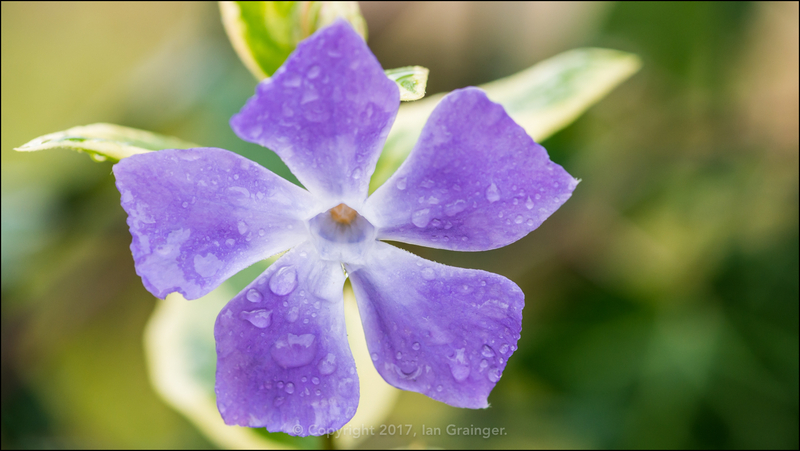 The Periwinkle (Vinca) plants were producing more and more flowers, and with any luck would be around until Springtime next year. 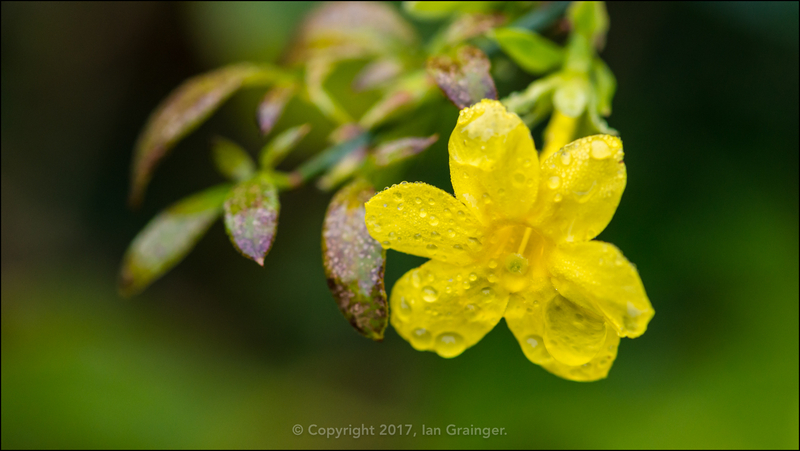 The same could be said of the Winter Jasmine (Jasminum nudiflorum), which was doing its normal good job of lighting up a rather dull looking hedge. 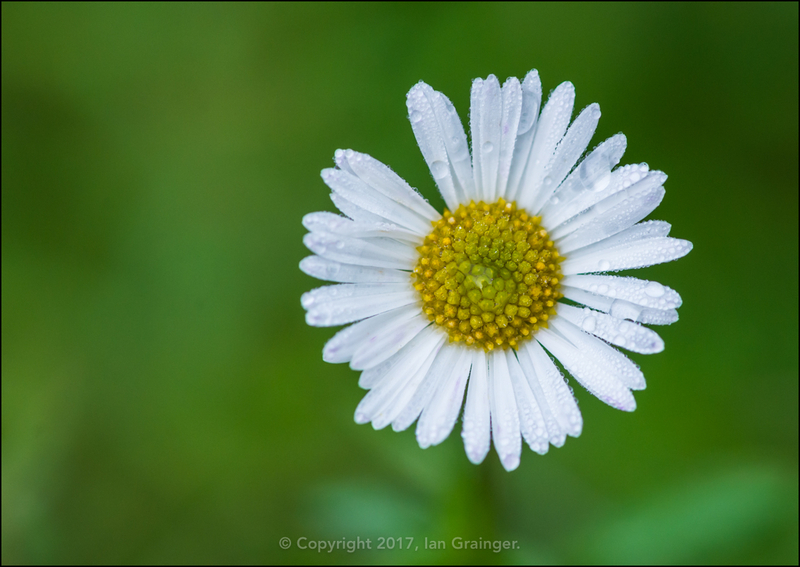 Remarkably, the Erigeron (Erigeron karvinskianus) blooms still seemed to have plenty of life in them, and were putting on a great display in a patio container. 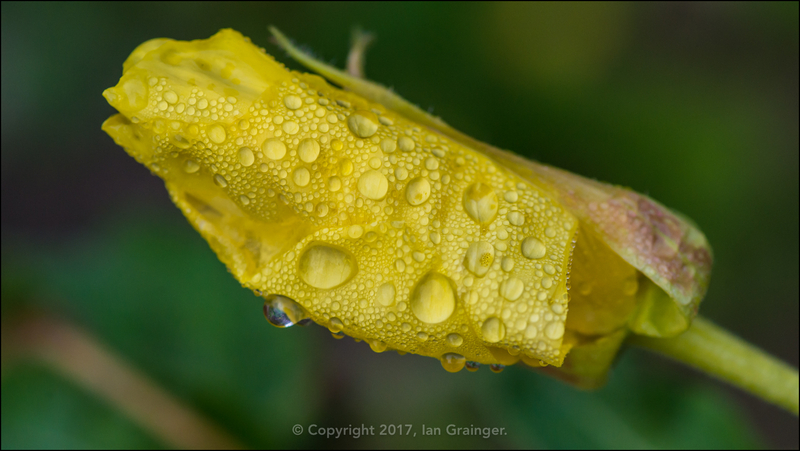 Like the Oxeye Daisy, this Evening Primrose (Oenothera) was the final one in the garden, and had also succumbed to the weight of the raindrops. 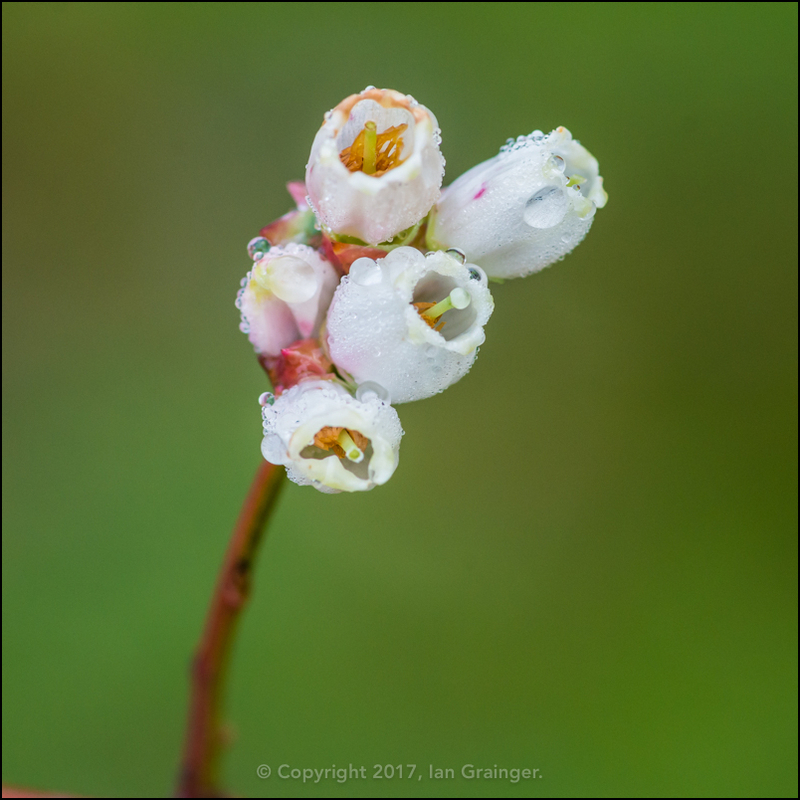 The very late Blueberry (Vaccinium) blossom was still hanging on, and there was still an outside chance of the bush producing more berries, but I was doubtful. 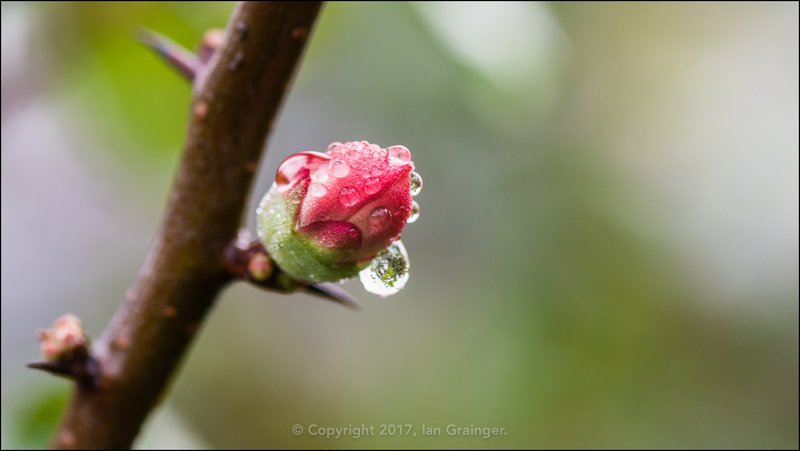 Meanwhile, the Quince (Chaenomeles) bush continued to produce more new blooms, while also holding on to its fruits from the previous crop of blossom. 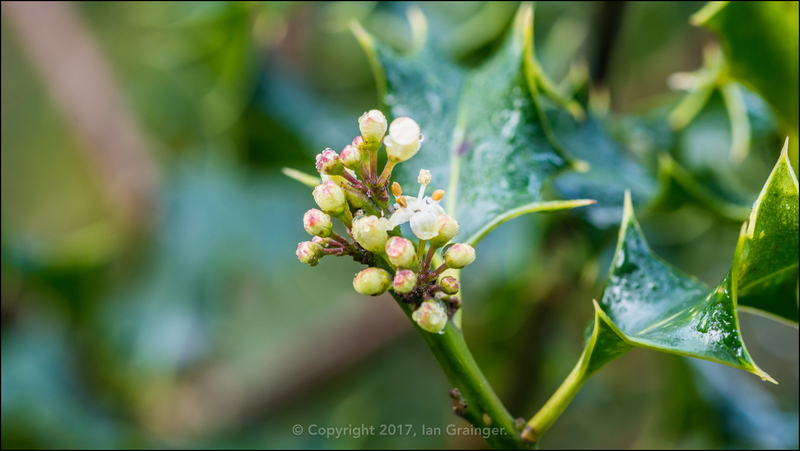 I was very excited to see that one of the Holly (Ilex) bushes was producing blossom, as this meant that we'd be seeing berries soon. In over 20 years of photographing dad's garden, I'd never witnessed them before! The Common Ivy (Hedera helix) was just ahead of the Holly, with its blooms just starting to turn into berries. The recent gale force winds meant that the Acer palmatum tree had lost the majority of its leaves, but the naked red branches that had been left behind were looking particularly pretty. 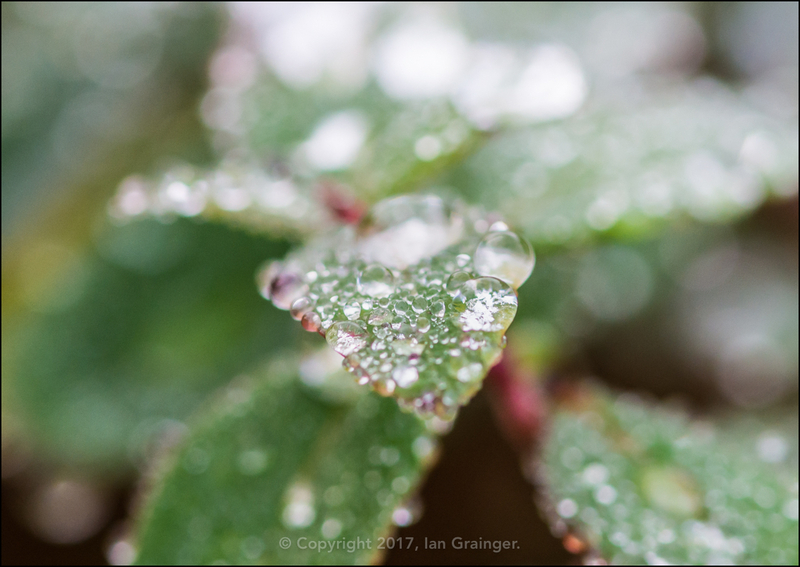 I couldn't resist sneaking in one shot of a bunch of raindrops resting on some leaves. To be honest, I could have done a whole article with this type of shot! Finally, I have some new fish to show you. 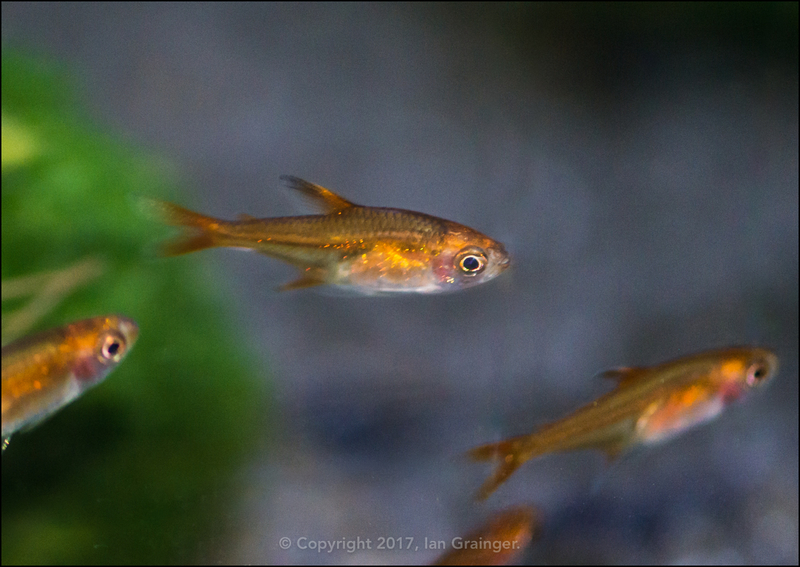 These little guys are nano fish called Ember Tetras (Hyphessobrycon amandae), and will eventually be going into the aquarium containing my Red Cherry Shrimp (Neocaridina davidi). At the moment the fish are in my quarantine tank, and will remain there for about a month until I'm positive they are disease free. They're currently only about 1.5cm long, and at full size will be less than 3cm, so they shouldn't be a threat to my thriving shrimp colony.